Hiiiiii errbody! It's Day 5 of Textured Polish Week! 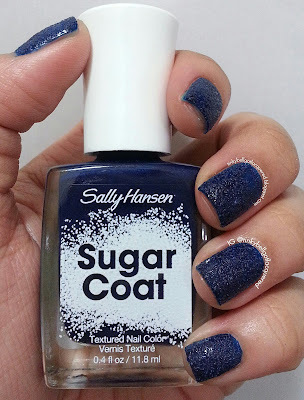 For this post I have for you three polishes from the second Sally Hansen Sugar Coat collection. First in line is Treat-Heart. Treat-Heart is a medium pink, glittery polish that dries to a matte, yet sparkly finish. 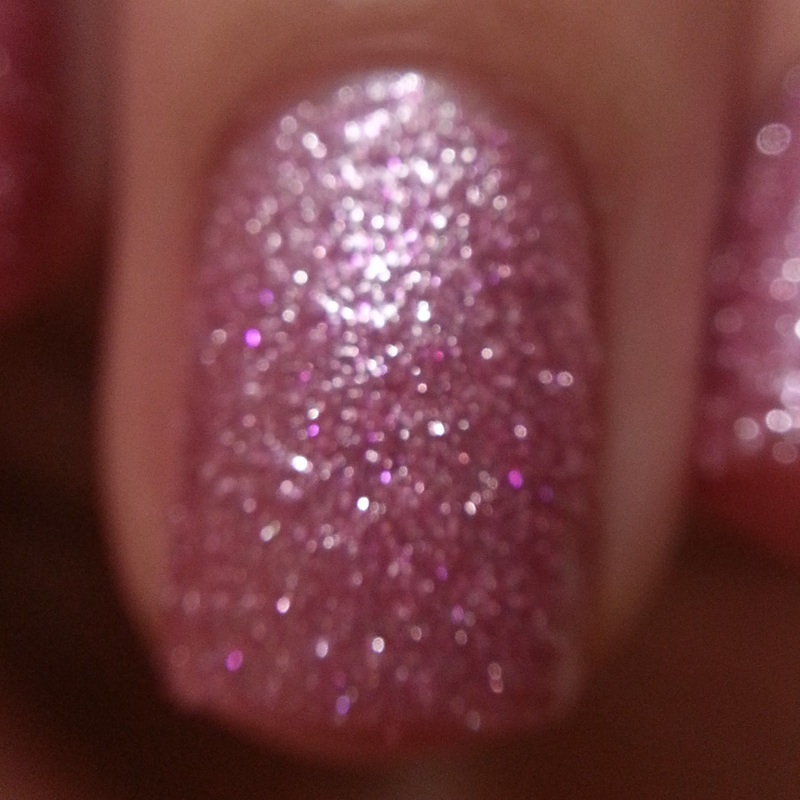 I received my macro lens in the mail so I went and did an unfocused macro shot of this polish because that was the only way I could capture the subtle hot pink glitters that's scattered throughout. This is three coats with no top coat. Royal Icing is a sheer, baby blue glittery polish that has this gorgeous pink sparkle that doesn't really translate in pics. I did a slightly unfocused macro shot to show the pink sparkle. If you own Sinful Colors Cinderella, Royal Icing is like the textured version of it. This is three coats, no undies, no top coat. And last but not the least, here is Laughie Taffy. 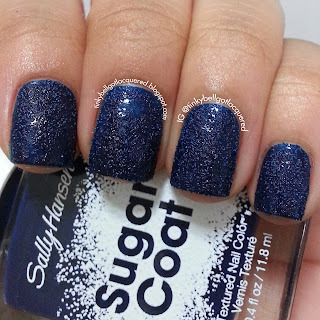 Laughie Taffy is a navy blue creme polish that dries to a textured finish. It's still fairly shiny when it dried. I did three coats for this one, with no top coat. Please excuse the bald spot on my middle finger... it was user error, not the polish's fault. They pretty much look the same, just that they went a bit darker and shinier. Thoughts? I love the colors of these polishes. I also love that they came out with sparkly polishes. Royal Icing was such an interesting color, although I wish the base color was a bit more opaque. I tried layering it over SC Cinderella but the texture wasn't the same. Treat-Heart was also a pretty color. It looked very sparkly in person! Laughie Taffy was also pretty, even though it's pretty dark for summer. Perfect for fall or winter! The texture was a bit like sandpaper, but top coat can solve that. The formula was pretty ok. Treat-Heart and Royal Icing were more like thin jelly polishes. Dry time was also good. Removal can also get messy if you do it the traditional way. Maybe foil method can help, but I've heard it can be drying on the nails. Would I recommend these polishes? For the color alone, yes. 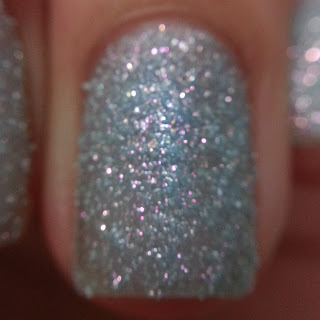 The colors are very pretty, and if you don't like the texture, you can always put on some top coat to smooth it out. Textured polish can be out of others' comfort zone, but it's fun to try something different once in a while. :) The price might be a bit expensive for a drugstore brand, but there are some deals/discounts from time to time so be sure to check out your local drugstore for them.